In a recent post (link here), I covered the issue of shares buy-backs and the lack of capex at the S&P500 constituents level. A recent report by Credit Suisse titled "The Capital Deployment Challenge" takes a look at the same problem. Per report: "Companies in the US market are currently in great health as corporate profitability is approaching historical highs. This high level of profitability has produced record levels of corporate cash, and thereby has created a challenge for managers: how to allocate all of this excess cash. 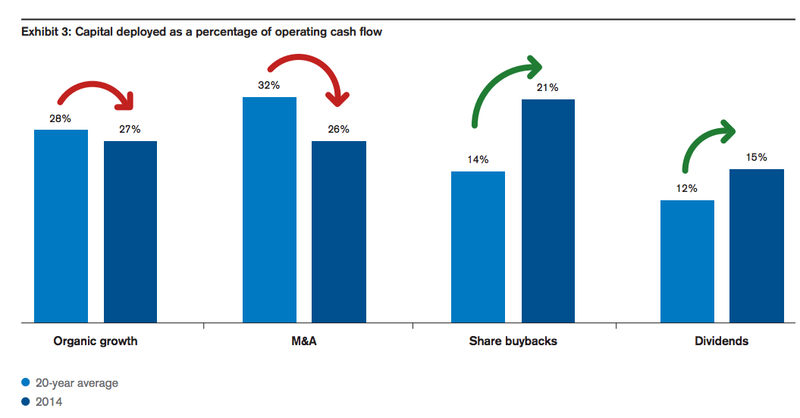 Companies may choose to reinvest in their businesses – organically or through M&A – or they may return the cash to capital providers, through dividends, share buybacks or by paying down debt..."
So Credit Suisse divide the S&P500 universe into two sets of companies: reinvestors and returners. 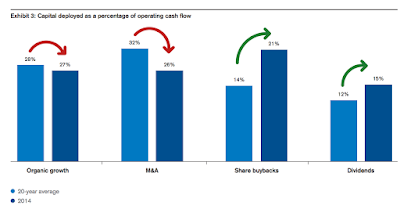 The former represents companies which predominantly direct their cash balances to organic reinvestment and/or M&A, whilst the latter are companies that prefer, on balance, to use cash surpluses for dividends and/or shares buybacks. The report looks at three metrics across each type of company: underperformers within each group - companies that underperformed their peers average in terms of total shareholder returns, outperformers - companies that outperform their peers average, and average across all companies. The chart above "shows that the initial level of returns on capital is generally lower for reinvestors than for returners, with an average of 9% and 11%, respectively. The reinvestors and returners who outperformed their peers both improved their CFROI. However, the outperforming reinvestors generated a greater operating improvement (180bps vs 150bps for returners)."